I forgot we were out of olives when I made this, so this photo is not fully representative of the salad. But you can use your imagination. You don't have to serve it on lettuce, but that helps stretch it out a little further. Combine dressing ingredients in a small bowl or container and let stand 1 hour. 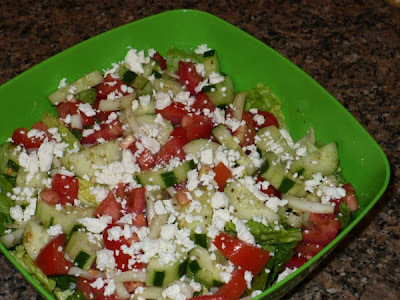 In a medium bowl, combine tomatoes, cucumbers, onion, and olives (if using). Pour dressing over and stir to coat.